Aspiring writer Edith M. Cushing devotes all her attention to writing, despite having some admirers in her father's circle. All that changes when she is swept off her feet by a dashing British aristocrat traveling to the States on a business venture. But what is it with Baronet Thomas Sharpe that rubs Edith's father the wrong way? 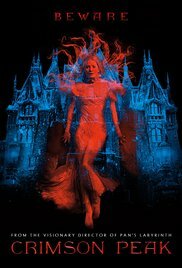 Masterfully written, directed and co-produced by Guillermo del Toro, Crimson Peak is a twisted fairy tale for adults, together with love--the right and the wrong kind—and a haunted mansion. In Crimson Peak, del Toro uses again classic gothic elements that worked so well in Pan's Labyrinth, except that in the latter he used the gothic to convey the horror experienced by a child during tumultuous political times, while in the former there is no parable, just madness. The story is more gothic mystery than conventional horror, but despite some screaming and small amount of gore, it is the mystery of what happened in the past and what the siblings want, that propel the film forward. Despite me not being a fan of horror movies, I ended up liking this one a lot. Del Toro kept the ensemble cast small, which lent an air of intimacy to this film. If you read my review of Madame Bovary starring Mia Wasikowska, you probably know that I was not only confounded but disappointed as well about the lack of emotions and total absence of chemistry between Wasikowska's Bovary and her lovers. Well, I am happy to report that her chemistry with Tom Hiddleston--Loki of Thor and Marvel's Avengers fame--is off the charts, on a similar level than with Michael Fassbender in Jane Eyre. Not only was I seduced by their chemistry, but I rooted for their love as well, knowing in an intuitive way that it wasn't going to last. Another great performance was that of Jessica Chastain as Lucille Sharpe, Thomas' sister. Chastain is quickly proving that she can act in any movie genre as long as the material is good. If you decide to give this movie a chance, go knowing as little as possible and you'll be in for quite a treat. I don't think I've ever seen a del Toro film that wasn't interesting. It sounds like this one might be another winner. Pan's Labyrinth is more up my alley, but I enjoyed this one a great deal. I liked it a lot, Jessica. Just keep in mind it is a mystery rather than horror, because people who were expecting to be spooked got disappointed. It is now in the queue! I saw the first two episodes of the British TV adaptation of Wolf Hall last week. I was disappointed. It just did not convey the power of the book, I thought. Have you watched the series or read the books? I bought the TV season last year but I only saw the first episode; it didn't click for some reason, but I intend to watch the full season if I can at some point. I also bought the TV adaptation of White Queen by Philippa Gregory, but that one I haven't tried at all yet. I wanted to see Jonathan Strange and Mr. Norrell, but after my disappointment with Wolf Hall I didn't want to risk it. Yes, I feel the same. Wolf Hall at least gets better in the second episode. I have Jonathan Strange in my queue (oh how I loved that book!) I will let you know how it is. Be sure to let me know as I would like to see it. I bought the book after I read your review. I had a great time watching it. Mia had great chemistry with Hiddleston, and that's one of the appeals because the movie is part romance, part gothic mystery. I enjoyed this one - very gothic indeed. It had a House of Usher type feel - the imagery was great. I know. Wasn't it great? !